The T8 ASE Test Task List, which lists the knowledge that a technician must have to pass the T8 ASE test. Extensive Preventive Maintenance Inspection information, including Engine Mechanical, Lubrication, Cooling, Air Induction, Fuel and Exhaust Systems; Instruments and Controls, Safety Equipment, and Heating & A/C Systems; Electrical/Electronic Systems; and Brake, Drivetrain, Suspension & Steering, and Frame and 5th Wheel Systems. A comprehensive Glossary, including all preventive maintenance inspection-related terms used in the Study Guide. 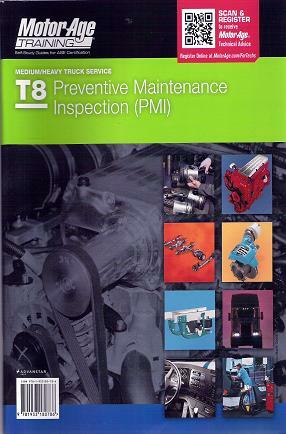 In addition to the easy-to-read text, the Motor Age T8 Medium/Heavy Truck Preventive Maintenance Inspection (PMI) Self-Study Guide contains dozens of useful illustrations, and like all Motor Age Self-Study Guides, it is spiral bound, which allows the pages to lie flat for ease of use. You ll also find the Motor Age T8 Medium/Heavy Truck Preventive Maintenance Inspection (PMI) Self-Study Guide to be a handy reference manual that you can use on the job after you ve taken the ASE test.